According to Canada's Polar Life, only 1,500 of Canada's 30,000 insect species are found above the tree line. Beyond that, merely 350 species are found in the high Arctic. In order to survive and reproduce, these insects depend on food from plants and animals in addition to special adaptations to make it through the Arctic Circle's harsh winters. According to Canada's Polar Life, the types of bugs found in the Arctic Circle include bees and wasps, plant lice, butterflies and moths, mosquitoes, flies and caddisflies, which resemble small moths. 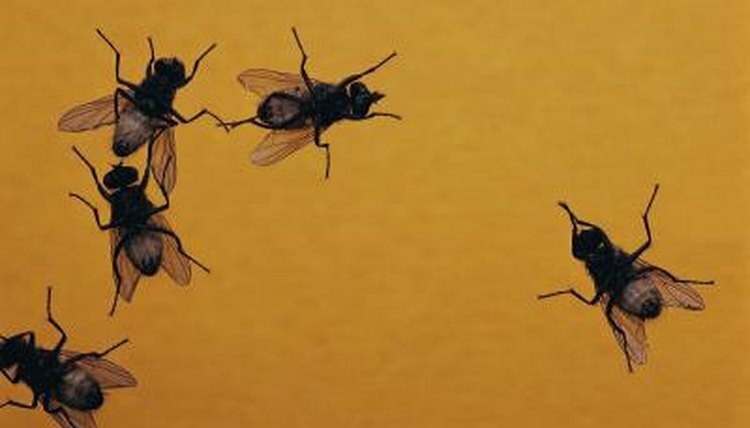 Flies are the most common of all bugs found in this cold, harsh environment, constituting half of the bug population. Arctic bugs eat an assortment of materials, although they tend to eat mostly plant matter. Nectar, pollen and plant liquids are their main sources of nourishment. Female Arctic mosquitoes depend on the blood of animals such as caribou and musk ox to survive and reproduce, while male Arctic mosquitoes consume plant nectar. Bugs that live in the Arctic play a critical role in their environment, a role that is similar to that of insects farther south. A large portion of their function as insects is pollination. By pollinating the Arctic plant life, these insects support the growth of new plants that other Arctic animals depend on to survive. Arctic insects also help consume decayed plant matter. And, of course, they serve as food for larger animals such as birds. Bugs of the Arctic Circle require special adaptations in order to survive. For example, Arctic bumblebees have thicker coats of hair than bumblebees living farther south. Arctic bumblebees also use their large wing muscles to shiver, which maintains their body heat. Wooly bear caterpillars produce a special chemical that prevents the water in their cells from freezing. Arctic white butterflies develop into pupa from larvae over the coldest months, so they can use their chrysalis shells to protect them from the elements. The nose bot fly has a creative method of dealing with the cold: it takes refuge in the nose of a caribou, even laying its eggs there. Do the Animals in the Tundra Migrate or Hibernate? Do Moths Have Blood in Their Bodies? Where Do Polar Bears Seek Shelter?